The future looks bright for Indian equities as economy is on the cusp of turn-around with decreasing interest rates, inflation under control, stable commodity prices, GST implementation in 2017 and expectation of earnings catching up with valuation. Investors with the horizon of 12 months can utilize ongoing correction to invest in Indian equities. Since last Diwali, Sensex and Nifty have given returns of 7.5% and 11.7% respectively (as on 25th Oct'16). However, the probability of the stock market giving better return in Samvat 2073 is higher than in the year gone by. Back to the present scenario, the road ahead seems promising. However, the global markets are likely to dictate the trend in the near future. We are pleased to inform you that we are in process of selecting 10 scrips from universe of large, mid and small cap stocks which can benefit investors during next 1 year. We are confident that these carefully selected stocks can outperform major indices like Sensex and Nifty during next 12 months. 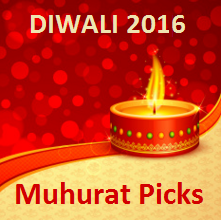 We will share Diwali Muhurat Portfolio 2016 of 10 stocks on 30th Oct'16 with all our paid subscribers of Hidden Gems, Value Picks & Wealth-Builder. Its time to also review our Rs. 1 Lakh Diwali Muhurat Portfolio of 10 stocks of 2015 released by us on 11th Nov 2015, we are glad to share that our portfolio has outperformed major indices Sensex and Nifty by 9.5% and 5.3% respectively. Sensex has given 7.5% (26,121 on 10th Nov'15 to 28,091 on 25th Oct'16) and Nifty has given 11.7% (7,783 on 10th Nov'15 to 8,691 on 25th Oct'16) returns during the year where as Saral Gyan Diwali Muhurat Portfolio of 10 stocks have outperformed both indices giving absolute returns of 17% in same period. Four stocks out of ten of our Diwali Muhurat Portfolio of last year have given returns in the range of 10% to 100%. Star performers of our portfolio were Capital First (returns of 101.6%) and Century Plyboard (returns of 44%), where as laggard were Pokarna and Granules India which have given negative returns of -16.6% and -13.6% respectively. Last year Muhurat Portfolio was shared with all our members on 11 Nov'15 and we will review the performance of the same and also share Rs. 1 lakh Diwali Muhurat Portfolio - 2016 on 30 Oct'16 well before muhurat trading session. The "muhurat" trading session will be conducted between 6.30 PM to 7.30 PM on the Diwali day, 30th October on leading bourses NSE and BSE. The special trading session would be conducted to pay obeisance to Lakshmi, the Hindu goddess of wealth and prosperity. It would also mark the New Year for traders as per the Hindu calendar, or Samvat 2073. If you wish to receive our Rs. 1 Lakh Diwali Muhurat Portfolio - 2016 of 10 Stocks, you can subscribe to our services under Dussehra - Diwali Offer of the Year, and we will activate your subscription within one hour. As we are operating on 30th Oct, we will ensure that you receive Saral Gyan Rs. 1 Lakh Diwali Muhurat Portfolio of 10 stocks before "Muhurat" trading session. Click here to know more about the offer. We have given the different allocation to each of the scrips keeping in mind the risk versus returns ratio. We have also fine tuned the portfolio with large cap, mid-cap and small cap scrips from different sectors so that the investors can invest in a complete mix of stocks to balance their portfolio. 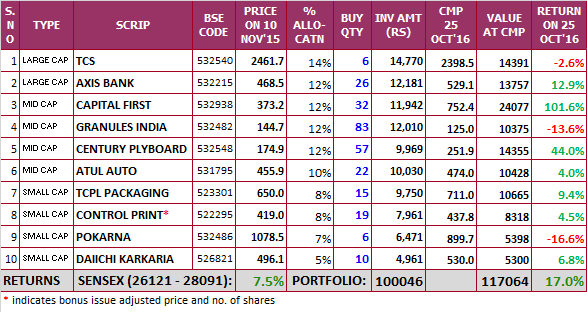 Saral Gyan Diwali Muhurat Portfolio of 10 Stocks for 2016 will also include best of Hidden Gems and Value Picks recommended by our equity analyst’s team during last couple of years. Multi-bagger stocks are created because they are able to scale the opportunity rapidly. Titan Industries is a great example. In 2003-04, Titan‘s market cap was 500 crores. In 2016, it is close to 33,100 crores. The fact that India is a booming marketplace of 130 crores consumers means that most products and services have a head start at trying to scale up their activities. Saral Gyan Diwali Muhurat Portfolio of 10 Stocks will be emailed to all our Hidden Gems, Value Picks and Wealth-Builder members on 30th Oct'16. Portfolio stocks holding period is minimum of one year, same will be evaluated by our analysts next year before Diwali festival. Enjoy discount up to 30% and valuable freebies under Dussehra - Diwali Offer of 2016. To know more about the offer, click here. Hurry! Last few days, offer closes on 2nd Nov'16.